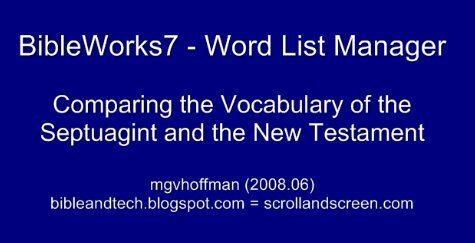 In a recent post, I demonstrated how the Word List Manager (WLM) in BibleWorks7 can be used to identify vocabulary that is unique to a particular biblical passage or book. That got me to thinking about really interesting and helpful things that can be done with the WLM, and I offer a video here to show what I mean. My question is this: How much of the Greek vocabulary of the New Testament overlaps with that of the Septuagint (LXX)? I am not suggesting that every word that occurs in both testaments is necessarily related. Given that the LXX is a significantly larger corpus, and presuming that the NT authors not only directly reference the LXX regularly but also are influenced by it more generally, my guess is that most of the NT lemmas (i.e., dictionary forms) also occur in the LXX. >> How will we go about trying to investigate this inquiry? The first (most frequent) word on the list of words that appears in the LXX but not the GNT was σαλωμων = Solomon. You probably are thinking, and rightly so, that "Solomon" must surely appear in the NT. So what is going on here? First, look up σαλωμων in the GING(rich) or Fri(berg) lexicon that are included with BW7. (If you have BDAG, you will also note that Codex Sinaiticus regularly spells it Σαλομων. References are provided for further study as well.) Second, look up "Solomon" in the NT using one of the English versions and note the Greek word / spelling that it renders. Now check and see if the GNT spelling occurs in the LXX. You should find one instance in 2 Samuel. Now compare this LXX text with the Hebrew that it translates. What do you note? I suspect that this is an example of the spelling of a transliterated name changing over time, but it is still a bit remarkable that the GNT never uses the spelling that is virtually always used in the LXX. I noted on the video that μαθητης is not used in the LXX. According to the Theological Dictionary of the New Testament (TDNT), "In its earliest literary use it [μαθητης] takes on the sense of pupil in analogy to μανθάνω. The oldest instance is in Hdt., 4, 77" which would place it in the 5th century BCE. 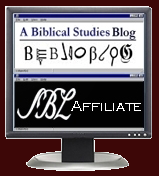 The verbal root "to learn" (μανθαν*) is used in the LXX, but the concept of a student/disciple apparently never arises or was not a commonly used word during the period when the Hebrew scriptures were being written. infrequent in the LXX? I would need to do further research, but it appears that the LXX preferred other synonyms, so διακον* is a word that became more common later. (Cf. the list in Louw Nida 35.19-35.30.) Or, as TDNT notes, διακον* in its background indicated serving at a table. There just are not that many table-serving settings or opportunities in the OT. I also note on the video that σταυρoς does not appear in the LXX. Crucifixion as a form of punishment was not a Jewish practice, though it was practiced by the Persians, Greeks, and others toward the end of the composition of the Hebrew scriptures. Conduct a search in the LXX for σταυρ* forms, and you will get two hits. Is crucifixion such as occurred with Jesus depicted in these texts? Very interesting news, but as to counting common words of LXX and NT in Bibleworks we cannot simply type "ge-bel" since some of the books are doubled in this list. That way you will exclude Josh(A), Judg(A), Tobit(S), Sus(TH), Dan(TH), and Bel(TH). First of all, I find your blog very intereting and it's a real mine of knowledge. As to comparing the vocabulary from books of one version and only some of the other ones, is a bit strange but I think acceptable :-) Only the statistics would require some more effort to find out the exact number of unique lemmas since some of them are counted twice, and the number 13848 would be decreased in this way. I thought it twice - the lemmas are ok. the program will find only the unique one - it's OK then. Is Bible Software Making Us Stupid?